Jon studiously studies the menu. Richard - The Empress has been a favourite curry house of mine for a while, for the food, the ambience and the Brown Bear next door. Not wanting to mess with success, I repeated my order from last time of pepper stuffed with lamb followed by Chicken Bhuna. Food was generally great, and the Bhuna was exceptional, although the keema nan was lacking meat. Neil - Compulsory first comment that drinks used to be a lot cheaper in The Brown Bear! That said, it is always a nice place to meet as not too busy and next door to two curry houses. Curry itself was a bit of a let-down after our previous visits. Veggie mixed starter was fresh but small. Also, after being talked into their choice of main course – a veggie curry with onion rice – I felt it wasn't really that special. On the plus side, we were looked after by the main guy who remembered us from previous years and the place was buzzing. Nice place, shame about the food! 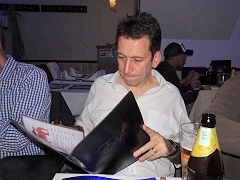 Dave - Excellent night at the king of the curry houses. Well looked after by the manager; he even changed my port for a Janice & ice. Curry and nan bread the highlights. Jon - Yet another solid performance from the Empress. It doesn't quite have the class that the Mehek did, but it consistently performs and is well worth its top billing. I went for the Empress Mixed Starter, which included the iconic Khadam Phool (I ain't getting' on no plane), and given the venue, I was prepared to risk something a little different for my main course, Dhaka Murh (sic) Dansak, which was chicken breast stuffed with minced lamb in a dansak sauce which was excellent. There was much discussion about the volume of vegetables again, although despite accusations of over ordering, we ended up short of mushroom bhaji. Politics was very much at the front of the discussion at my end of the table at least – more high brow than usual and it remained courteous! Dominic - This month saw another solid performance from the always busy Empress although our seating was a tad cramped this time despite having a spare seat due to an odd number of attendees. Service was generally very good, however there seemed to be a delay for some in receiving the rice which then impacted on the way the sides were dished out (more on that later). I started with the Mysore Chilli Prawn which was a spicier version of a Puri which was quite tasty and nicely presented. My main of the Lamb Rajshahi which I asked to be additionally spiced was excellent in both flavour and quantity. The veg was all good but it has to be said that, if there is consensus that we have under-ordered, then make the effort to take less of a portion to make it go round and then order some more rather than have those that get their meals / rice first dolling out what they want and having some of us go without! ... so thanks to Jon for sharing some of his few mushrooms ... much appreciated and very tasty! The stuffed Paratha was just ok this time which should mean Diggers loved it! And given it was another "dry" evening (by choice) it meant I could fully observe the extensive and animated discussion on politics at our end of the table and everyone shouting at Griff at the other to try to wrench him from his "alternate universe" and back into the conversation at hand! Special mention for Jon's understudy performance with the "finger ordering" but if truth be told, we need the "Master" back! Brian - I really like this restaurant. It's entirely non-pretentious, it's located at the not-yet-regenerated end of Leman Street, it's really friendly and the food is great. I was determined to avoid my usual starter (mussels), and was veered towards the Garlic Prawns by the owner/manager, and they were superb. The staff weren't apparently happy with the tilapia, so they asked whether they could make the cumin tilapia I'd ordered with salmon instead. I agreed, and that too was excellent. Veggies / sides / beers were all good. Robin - The service was very good despite the restaurant being reasonably busy. I had a very nice king prawn puree to start, in lovely bread with an excellent sauce and about 5 or 6 nice juicy prawns. I tried the king prawn madras for my main course, and although the prawns were just as nice (no surprise there) I felt that the madras sauce was a little bit thin and not particularly flavourful. The special rice was great and so were the veg dishes, as usual. My half of keema nan had all of the meat compacted into half of it, so not very impressive. Nevertheless overall I would definitely go back (and revert to some kind of tikka main dish) so my VFM mark reflects that. Tim - This place has a pleasant ambience, the unusual decor featuring large wooden carvings on the walls. I'm glad to see they've introduced large bottles of Kingfisher since our last visit. They brought out an extra spicy onion in tamarind(?) sauce to have with the poppadoms, alongside the usual four accompaniments. 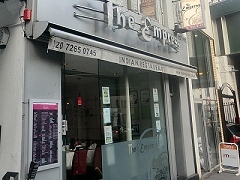 I had the Empress mixed starter, which contained some of their more unusual starters: nazakat, pancake kebab, khadom phool - an interesting mix; although it reminded me I'd had khadom phool before and wished there was more meat in it. I'd asked for a recommendation for my main, something with fenugreek and a sharp flavour with a bit of spice; the lamb rajshahi fitted the bill nicely, although I found the inedible pieces of green mango a bit irritating. The keema nan was good, not too doughy and with nice herbs, though not all of the pieces had meat in. We were offered a round of port to finish, welcome though no doubt cheaper than offering Baileys and Tia Maria. The service was mostly good, but apart from the manager, the staff seemed a bit young and inattentive. It was also a fair bit more expensive than last time, but overall still a very good meal. Mark - Graeme's absence along with sight of the lesser spotted Robin meant a change to the usual line up and a quick shuffle re the team selections with 2 dropouts and a surprise appearance from Brian which meant we ended up with 9 which seemed to amaze those that kept trying to insist we only needed a table for 8. Having been commended by the Manager on my pizza poppadum I enjoyed my chicken stuffed pepper starter and upon questioning him about the seeds I was told they include the heart as that adds an additional flavour. I'll discuss this with Mrs K next time we cook similar. For main I went for something different and had the lamb with garlic and ginger. This was very tasty although I did not taste much ginger (perhaps because I don't have all the sauce?). The Pilau rice at the Empress is not as colourful as some other places but has good texture and not oily. As usual we spent about £50 on veg which is not of interest to me. Another enjoyable evening out only slightly spoiled at the end by the failure of Govia Thameslink to run trains that match the timetable or 'current services' app details. I predict England will win the World Cup 2018 and we will return to the Empress in 2019 - I'm expecting at least 50% strike rate which is possibly better than Nostradamus. One last thought, is Dom still feeling a bit soft?